One of the best (and easiest) ways to spice up your lessons and keep students more engaged is to integrate something that students are already thinking about. At the end and beginning of the school year (in the US anyway), what do kids have on their minds? SUMMER! 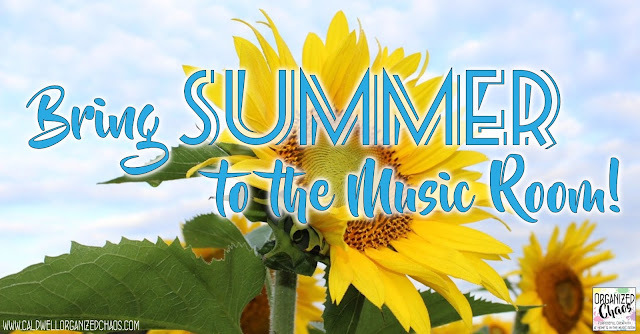 Here are 4 simple ways to take your lessons and instantly make them more engaging by summer-ifying them! What is it about chalk that feels like summer? I found some cheap little chalkboards at the Dollar Tree recently (like these) that I love to pull out at this time of year but you could also use sidewalk chalk on any chalkboard or even take the class outside to draw on the ground! This is a simple way to change up any dictation or review game by having students write their answers in chalk, use it to practice drawing music symbols, or even have students write a short composition. Beach balls are a perfect way to bring the summer vibe indoors! I use them as a simple way to have teams or individual students take turns- after they take their turn answering a question or participating in a game they choose who to pass it to next- or make it into a game itself by writing different questions on each section of the ball. Wherever their right thumb is when they catch it, that's the question they have to answer! It's an easy way to review vocabulary too- just draw a symbol on each section and have students identify the name and/or meaning. I love using manipulatives for composition and dictation (read all about what I use, where I get them, and how I use them in this blog post). For summer, I look for erasers, toys, and stickers in the shape of sunflowers, suns, flip flops, ice cream cones, beach balls, pineapples, or watermelon slices to go with the summer theme. Of course another great way to bring summer to music class is through summery music! Aimee from O for Tuna Orff wrote some great blog posts full of summery music lesson material- here's one on music about the ocean, and here's another on camping and mountain songs. Baseball-themed songs would be great too- here's my post on how I use "Take Me Out to the Ballgame". 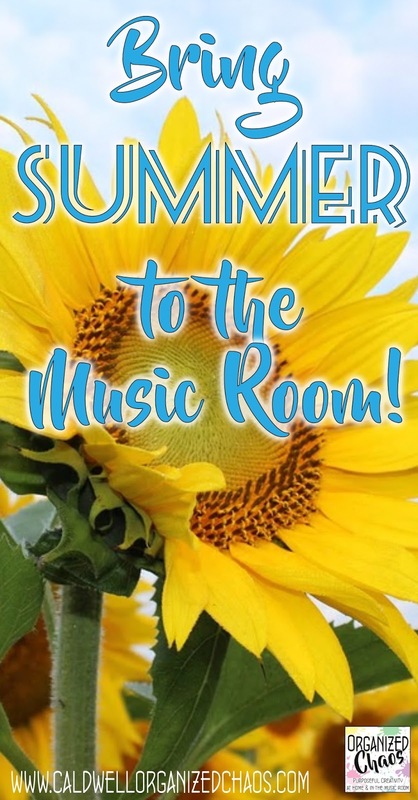 What are your favorite ways to bring summer into your music classroom? If you're still teaching for a few more weeks like I am, I hope you can try some of these out in your classes before the end of the year! Don't forget though, kids will definitely still be thinking about summer when we get back next school year, so hang onto these ideas for back to school time too! Looking for more lesson ideas for the end of the school year? This post has tons of review games, and this post has more fun lesson ideas perfect for the end of the year. Want to get free curriculum resources, tips, and more sent straight to your inbox? Click here to sign up for the Organized Chaos newsletter!